Written up in 2003 ….. Looking down on Whiteman’s paddocks below the start of where Lilly Pilly Rd. is now …. It was below this road that we found a butchers bird nest in a small tree in the open paddock. The main Wilsons Creek Rd. is in the top right of the photo amongst the big dark trees. In the late 1880’s and early 1990’s this was a track operated by bullock teams. Hobbies …… collecting birds eggs …. Whilst at the primary school I was really into collecting birds eggs. It all began soon after I started school when Mum and I went to look at a butcher birds nest in a small tree in one of Whiteman’s paddocks below the start of where Lilly Pilly Rd. She came down with the egg in her mouth to protect it …. see the photos above. In the 1950’s and 1960’s you could enter and roam free will across any ones land at any time. In the 1970’s that all changed as land was subdivided into smaller portions. Whiteman’s owned a large area of farmland …. they owned all the land above the road right up to the Koonyum Range and down to the edges of Wilsons Creek itself ….. they ran a dairy farm and the paddocks were totally open grass paddocks compared to the closed-in look created by all the camphor laurels which have grown up since the early 1990’s. It was below this road that we found a butchers bird nest in a small tree in the open paddock around where Lilly Pilly Rd. is now. With the butcher birds nest, Mum climbed up the tree and got me one green speckled egg. She showed me how to blow out the yolk with a tiny hole drilled in each end with a pin when we got home. From then on I only collected one egg from any nest I collected from ….. which came from an unknowing conservation awareness. At the school we had a copy of Neville W. Cayley’s book ‘What Bird is That …. A Guidebook to The Birds of Australia’. This book first published in 1931 has beautiful handpainted bird illustrations with careful codes and detailed notes on bird distribution, general notes, the type of nest and eggs. In Primary School I knew this book backwards and could identify most bird species very quickly. I have been given a present of this book in recent times and it is a very good reminder of a portion of my life in the 1950’s and 1960’s. I would roam cross the paddocks after school looking for nests … Into the loop near Brown’s gate up near the Wilsons Creek road there was big crows ash tree ….. Fig birds would have several nests in the tree. 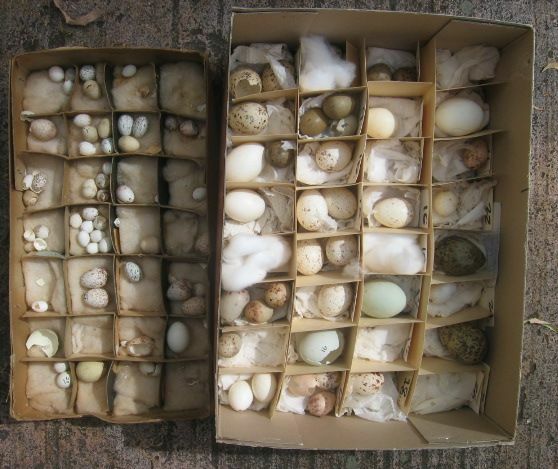 I still have my extensive egg collection in their shoe boxes which are divided by the original cardboard dividers and softened in a bed of cotton wool … I continued collecting birds eggs right through High School. Tall gums with a crows nest up on Whiteman’s land …… Anthony Stone was one of my primary companions ..… his family live up the track above the Wilson’s Creek Public School ….. I told him about a hawks nest and a crows nest on Whiteman’s land … the crows nest was in some tall clumps of stringybark trees. We went together and showed him where the two nests were it was all a bit of the exploration of the mysteriousness of life for me .…. Anthony somehow climbed up fifty metres up the stringybark tree and got a crows egg for his collection …. I then took him across to the fence on the other side of the paddock where I showed him an eagles nest in a tree on a thin branch at the very top of the tree. He had an egg catcher made from a long stick with a spoon …. but he didn’t get any egg out of the nest …. that is how I got the idea for my egg catcher made from a ring of wire with a toe of old stocking sewn to its end … still got my birds egg collection after all these years. I had learned how to make an egg stick by taking a long stick and wiring on a loop of wire at one end …… then sewing the cut – off toe of one of Mums disused stockings into the loop …. I made little net at the end of the stick to dip eggs out of a nest with ….. I would climb up a tree where there was nest like a pee wee’s mud nest right on a thin limb ….. by reaching with my stick you could scoop it in the nest and take out one egg. By withdrawing the stick in, you could take out the egg and put it in my mouth and bring it down to safety on the ground. A number of the eggs have great personal significance to me as they represented major discoveries of life and nature. Blue Crane: one afternoon after school, I was wandering with Johnny Greentree down along the little creek which flowed through Whipp’s lower dairy paddock and we came upon a big red cedar tree. About four metres up in a high branch, a blue crane had made its thin twig flat nest on a stretching branch. The bird was on the nest and flew off on our approach and out of the nest fell a 40 mm long light blue egg. It wasn’t a full egg but only the shell of an egg from when the nestling had hatched out. The shell fell gently to the ground. To have this still in my collection forty five years on represents some about the Wilsons Creek area. The blue crane was an elusive and furtive bird as it stalked in shallow areas of water or amongst the grass in paddocks. It had a hidden quality to it which was hard to know. Finding a nest represented finding something of this hidden quality. Plovers Egg: as we walked down Mr. Browns road …. 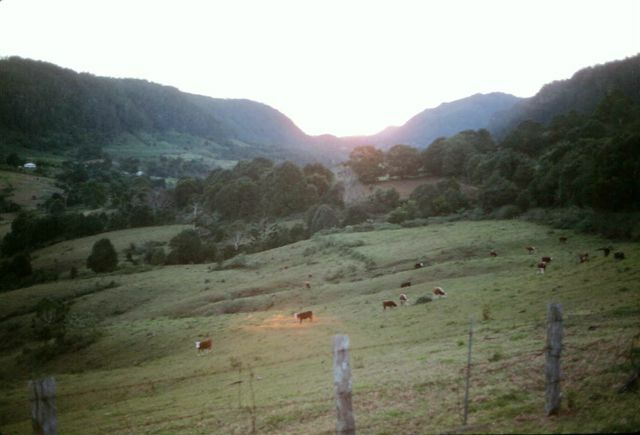 now called ‘Blackbean Rd.’ ….. there was a large open cow paddock below the road. A plover used to get very aggressive and attack us in the nesting in September ….. we would have sticks swinging around our heads to ward them off. I knew it must be guarding a nest so one afternoon I gradually appeared over the bank and watched the plover land and settle on its nest out in the paddock. I marked the spot with my eye and began steadily walking to the spot. Of course the bird became very agitated and started attacking me. Walking steadily to the spot I came a grass lined depression the ground with cluster of olive speckled 40 mm long eggs. The one in my collection is from that time. Scrub Wren’s Egg: I was down at our swimming hole below our house one afternoon and I saw in the side of a clump of fine leaved lomandra sedge, a nest about 180 mm * 100 mm across built out of fine grass woven into a stretched ball like shape with a small 60 mm hooded entry hole near the top of the nest. Inside was a cluster small 200 mm white eggs with brown speckles on the egg. More speckles were at the top of the egg. From my bird books I had discovered a scrub wrens nest. Again the scrub wren represented the undiscovered hidden part of life …… a small brown /grey bird which lived a life in the shadier sections of the forest. In 2003, Gerald my brother in Sydney sent me the website for Wilsons Creek Primary School where he and I went to primary school in the 1950’s ….. at www.wilsonscrk-p.schools.nsw.edu.au/. ….. the students have designed this website with help of their teacher. I had signed the guestbook and soon after that Susan, now a retiring teacher invited me to come and speak at the school when I was down from Brisbane. In 2004, I phoned Simon Cook the new principal and asked him if I could speak on Monday the 1st of November. He said they would be glad to have me out and speak about the school 50 years on. It was with some intrepidation yet excitement that that Claire my daughter drove me out to the school by 11. a.m. to meet the teachers and speak to the children at 11.30 a.m. Claire being a trainee teacher got me to turn my whole talk into an interaction around 5-10 questions then feed in my experiences from the 1950’s when Gerald and I were there. I spoke to 60 children for right on half an hour …… the questions just worked wonderfully. I had dozens of hands up all the time …… many wanted to participate. 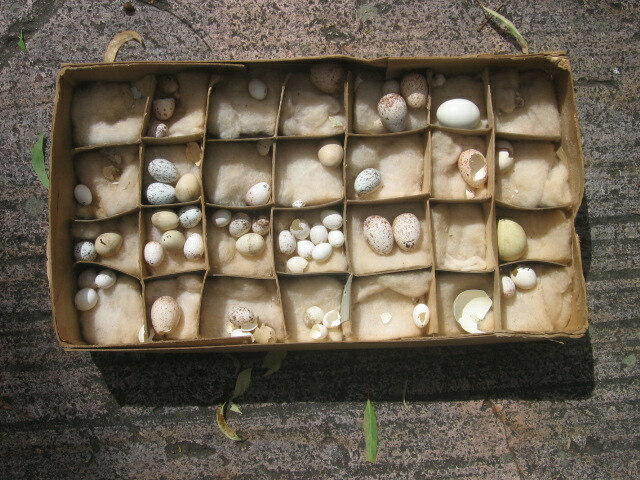 I even had my old birds egg collection from 40- 50 years ago ….. many wanted to see that at the end of my talk. I had a piece of petrified wood I found in the gully volcanic tuff rock wall in the early 1960’s when I found the bat cave under the cliffs where Mr. Cox’s bananas were (one of the many banana growers in the area at the time) ….. we talked about the bat cave etc. It turned into wonderful time. One of the things that has changed in a major way, is that there NO open space anymore …. no open cow paddocks or banana plantations … it is all closed bush ….. planted by many new owners or regrowth. Camphor Laurel trees are everywhere!! What was Brown’s road (an old couple who came on bullock tracks to Wilsons Creek in the early 1900’s) ….. is now called ‘Blackbean Rd.’ ….. you cannot see Brown’s house ….. it is all surrounded by dense trees. See the post on this website: Browns House at Wilsons Creek as in January 2008.